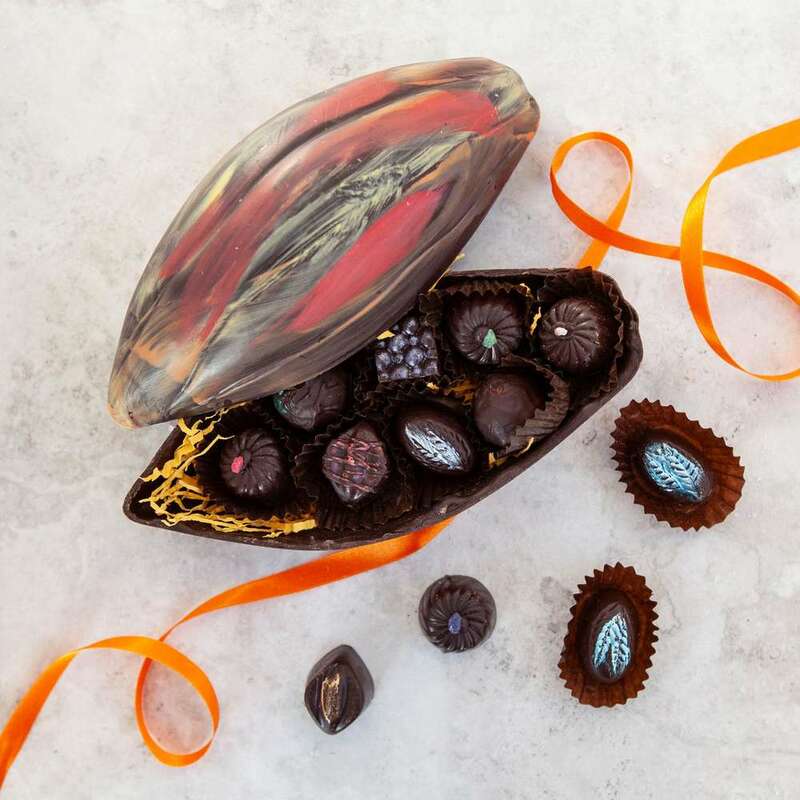 Your box contains Champagne truffles in special heart-shaped shells, Raspberry Truffles, Vodka-Cherry Truffles and Sea-salted Caramel Truffles packed in a beautiful red Valentine's gift box. Available in a box of 12 or 24 chocolates - choose what size you want by selecting from the options. Suitable for Vegans, dairy free. Contains alcohol. FREE STANDARD UK DELIVERY ON ALL SIZES An amazing assortment of fresh dairy free chocolates in a variety of flavours. All chocolates are handmade using natural, high quality ingredients.Some of our best selling flavours are: Sea-salted Caramel, Mint and Maple*, Nicaragua*, Tanzania, Tonka, Cardamom, Coffee-hazelnut, Coconut, Ginger, Peanut Butter, Hazelnut, Orange, Lemon, Raspberry, Passionfruit &amp; Mango, Champagne, Plum Schnapps, Vodka Cherry, Rose, Violet, Geranium and Peppermint Creams. * Academy of Choclate and Great Taste Award winners.To see the our current assortment please check here: Current Flavours. When ordering one of our selection boxes you can let us know your flavour preferences by using the "message" box at the bottom of this page.Dairy free, suitable for vegans. You can choose a no honey selection by choosing the option available.Available in a box of 6, 12, 18, 24 or 48 chocolates - choose what size you want by selecting from the options.Shelf life &amp; storage:Made fresh with no artificial ingredients or preservatives, so eat as soon as possible, preferably within two weeks. Best enjoyed fresh at room temperature. Store in a cool, dry place.If you are ordering your chocolates in advance for a specific date, please give us your required delivery date in the "Ordering for a specific date?" section below and we will send your order to be with you for that date.Add a gift message:Use the "Message" section below to add your personal message. We will print this on our complimentary card, and include it with your gift free of charge.You may also use this message section to let us know about flavour preferences and dietary requirements, e.g. 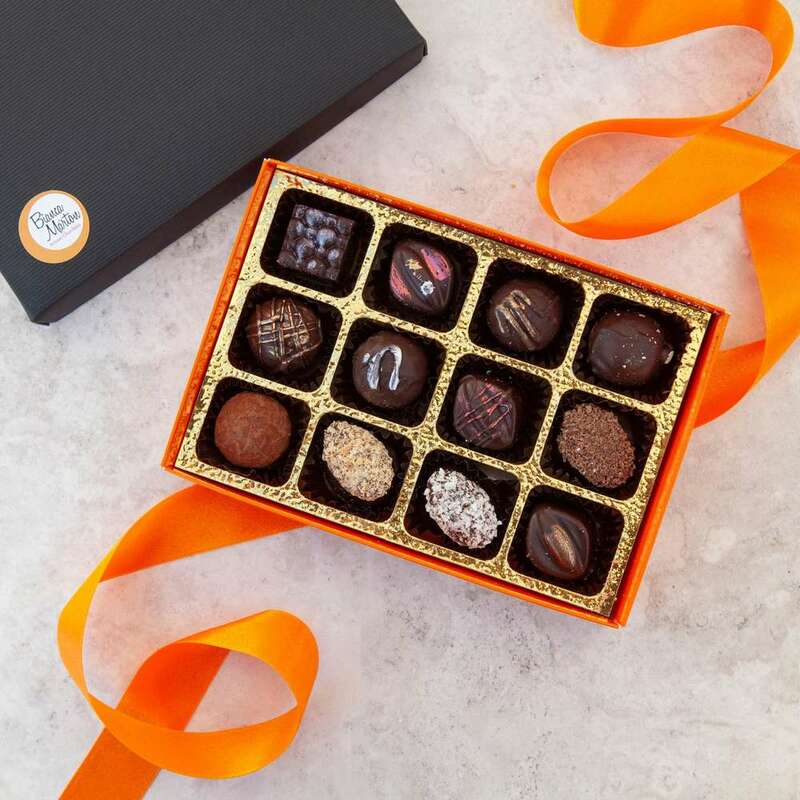 include Champagne truffles, no alcohol, no nuts, etc.Nutritional values of individual truffles, shelf life and storage instructions are listed on the About Our Chocolates page.